Named after the Greek mythology, Centaur, a half-man half-horse creature… this concept vehicle by Segway actual fits the name. Wow! You really need to watch the video… it sounds like an electric R/C car, looks like a slimmed down ATV, but performs like nothing else I’ve seen before!! That is probably due to its weight of only 150 pounds. The Centaur can move at just over 20 miles per hour an runs on batteries that use regenerative braking, which means the batteries are recharged during deceleration and hill descents. 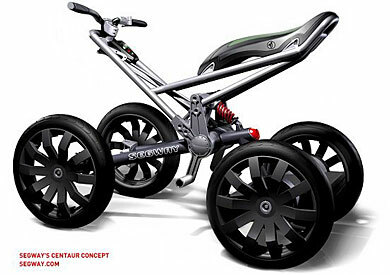 Segway doesn’t have any plans to manufacture the Centaur… but if they did… I bet it would be serious hit. I can see ESPN XGAMES events create especially for the Centaur.